I hate to waste anything. So when I was house-sitting for a friend and the figs on her tree were so ripe they were plopping to the ground, I picked them, washed them off, and decided to make fig newtons. This was a serious project. Much more serious than I usually am about baking because I’m not a great baker. So I broke it into manageable blocks: I made the fig paste one day, the dough another morning, and the cookies themselves later that afternoon. I’m going to walk you through the steps below, but if you think “wouldn’t it just be easier to buy them at the store?”, the answer is no no no. These are beyond superior to the packaged stuff—they are more like a jam cookie than a Newton. Since it’s the end of fig season and you may not have a tree to access, look for super-ripe, almost splitting, figs at the farmers’ market. Or wait until Christmas and make these with dried figs. I promise. It’s not a waste of time. 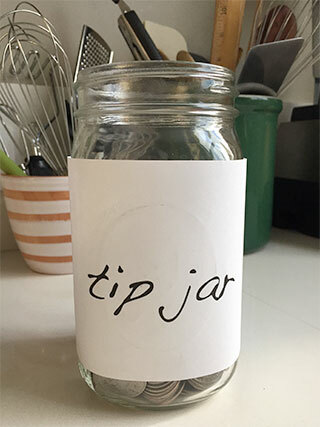 1. make the jam paste up to 3 days ahead; your figs should be so ripe they are almost shriveled and cracking (if you have a farmer friend at the market, ask if they have any windfall figs they’ll sell you). 2. make the dough up to a day ahead. Roll it out on parchment paper because it is sticky. Shape a rectangle and trim off the jagged edges and cut it in half. 3. spread the fig paste down one edge of dough; use water to brush the edges then fold the dough over and seal it to form a log. 4. once you have formed both logs, lift up the parchment paper they are on and place it on a baking sheet; this keeps the transferring process to and from the oven really simple. 5. cut the logs into slices while they are still warm, then steam then in a plastic bag or on a plate with plastic; this is essential to get the soft crust that’s typical of newtons. If you cool them without steaming, they get crisp like shortbread. To make the filling, remove and discard stems from fresh figs and cut or tear figs into chunks (do not peel them). In a heavy saucepan, combine figs with sugar, water, vanilla, and cinnamon. Bring to a boil then reduce heat to medium and cook, stirring often, for 45 minutes or until figs are broken down and mixture is jammy and thick. Let cool completely. In a food processor with the metal blade, pulse the fig-sugar mixture until it forms a smooth paste (the seeds will remain whole). If the mixture lightens in color from the air being whipped in, don’t worry as it will darken as it stands afterwards. The paste can be made up to 3 days ahead; cover and refrigerate until ready to use. To make the cookies, in a mixing bowl with electric beaters, cream the butter and sugar. Add the egg, vanilla, and orange juice and beat to combine. In another bowl, whisk together flour, baking powder, and salt. Gradually beat dry ingredients into butter mixture, mixing until a soft dough forms. Scrape the dough onto a large piece of plastic wrap or waxed paper and pat into a rough rectangle. Wrap tightly with the plastic or waxed paper and refrigerate until firm, about 3 hours or up to 1 day. When ready to shape and bake the cookies, preheat the oven to 350°F. Remove fig paste from refrigerator if chilled and set aside. Place a large piece of parchment paper on the counter and dust with flour. Unwrap dough and place it on the floured paper and dust top with flour; cover with another piece of parchment. Roll the dough between the parchment sheets to form an 8×14-inch rectangle about ¼-inch thick. Peel off the top piece of parchment and with a sharp knife, trim off the rough edges and cut the rectangle in half lengthwise; move one piece slightly over on the paper to make room between the halves. Spread half the fig paste lengthwise along half of each rectangle, about 1 inch in from the side. 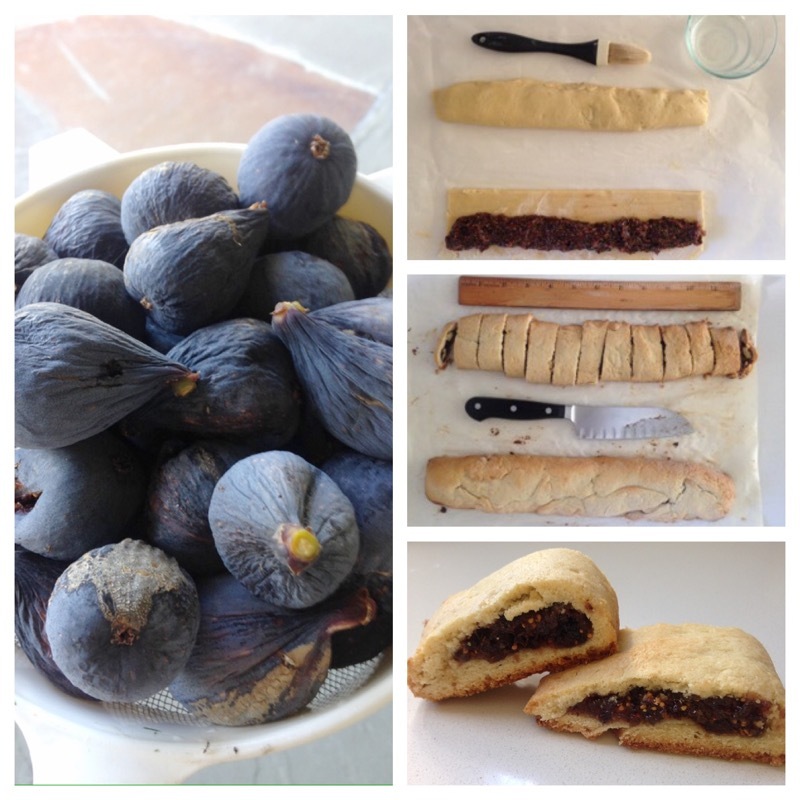 Brush the edges with cold water then fold dough lengthwise over fig paste and pinch edges and ends to seal. You will now have 2 logs on the parchment sheet. Gently lift the parchment sheet with the logs on it and place it on a large baking sheet. Bake for 25 minutes or until crust turns golden brown. Remove the baking sheet and let cool on a rack for 5 minutes then slide the parchment sheet with the logs still attached off the baking sheet and onto the counter. With a sharp knife, slice the logs into 1-inch pieces while still warm. Transfer the pieces to a large plastic bag and seal it, or place on a plate and cover tightly with plastic wrap; this steams the cookies so the crust stays soft like packaged fig newtons. Let cool then remove from the plastic and eat.